This period between Christmas and New Year always strikes me as a sort of time out of time -- a bit of travel, no real work to do, parties, time with family, seeing friends I haven't seen in a while. I can't keep track of what day of the week it is. OK, it's Sunday. This afternoon I printed the text and waves layer on the "They Looked Behind" print. I had briefly considered doing the text on a separate block so it could be a different color, but I liked it all on one block so that the text looks like it's just part of the wave pattern when you look at it from a distance. One more layer to print. On another note, I just got home from seeing the movie Milk. I loved it. Sean Penn did a great performance as a gay man. I forgot all about him being Sean Penn. I was in college in upstate NY when Milk was killed. I don't remember him so much, but I remember Anita Bryant very well. She got us gay people all fired up! 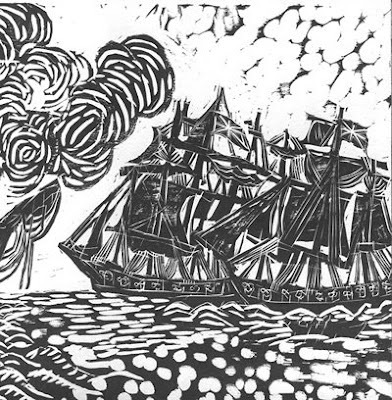 I'm including William Bradford's words about the ocean in this print, so the next thing I did was carve the lettering. The type is based on The Fell Types, which take their name from John Fell, a Bishop of Oxford in the seventeenth-century who wanted to be a publisher. I like the crudeness of the lettering, as much of the printed matter from Colonial America was also crude. Next I began to carve some waves. I'm using a technique that I read about in a moku hanga book, where one side of the relief area is cut at a very shallow angle to make a soft and irregular edge. I thought that this method would look better with the softer "round clouds" than a hard edge. Still quite a bit more carving to do before I print again. I love my local public library. I found a book there called A Dictionary of Colonial American Printers' Ornaments & Illustrations and I've been poring over it for days. All of the ornaments and illustrations in the book are relief prints produced in the American colonies from 1639 through 1773. As I looked through the book I noticed what seems to be a convention in depicting clouds, especially clouds that reveal some sort of apparition or miraculous event. The clouds are kind of round and puffy. "If they looked behind them, there was the mighty ocean which they had passed and was now as a main bar and gulf to separate them from all the civil parts of the world." This is the only description he gives of the voyage, but it's so evocative even in its brevity. These people had not a clue where they were going except for the few accounts they had heard or read, most of which were romanticized published jounals by various explorers who had been to the Americas. The passengers were crammed into a very small space, so small that some of them slept in a boat called a shallop that they were carrying with them for explorations once they reached the new world. The seas were rough and many of the passengers suffered from sea sickness. It's quite certain that it was a miserable journey for the Mayflower Puritans. This print will incorporate the Bradford quote. I used a lot of rice paste for this first impression so that my brush strokes would show. It's often said that everything has already been done, and maybe it's true. I found a book at my local library called Nantucket Woodcuts illustrated by previously blogged woodcut artist Naoko Matsubara. With text by Matsubara's mentor Fritz Eichenberg, this 1967 book outlines the history of Nantucket Island, located just a few miles off the coast of what was once the Plymouth Colony of Massachusetts. 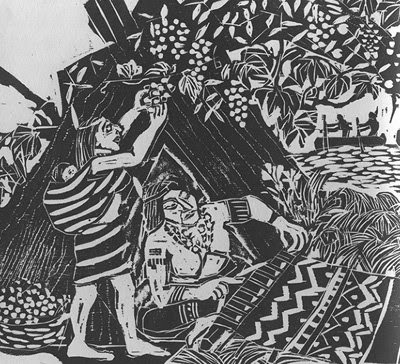 Looking at Matsubara's carvings, I can see that she referenced some of the old colonial woodcuts that I've been looking at too. The translation is distinctly Matsubara's, though, with her loose and expressive cutting. Coming across this work makes me feel a bit daunted, but hopefully whatever prints I make about the Mayflower pilgrims will have my own peculiar twist on them just as Matsubara's prints have her mark on them. I've been reading a book called Mayflower by Nathaniel Philbrick, a surprisingly riveting history of the 55 years between the arrival of the Puritans in Plymouth and the end of King Philip's War, the bloody war between the Indians and the colonists that was fought in New England from June 1675 to August 1676. Philbrick has followed primary texts in his account of the early years of Plymouth colony, including William Bradford's diary, published under the title Of Plymouth Plantation. Bradford's diary says very little about the grueling 66-day voyage, but one thing he does say is that on September 6, 1620, the Mayflower set out from Plymouth England "with a prosperous wind." I thought that would be a fitting title for this first print. There were 102 passengers crammed onto what was probably a 113-foot boat, and the ship only averaged about 2 miles per hour on its 3,000-mile journey. But the Puritans believed that God's hand guided their every action. I wanted the print to be very vertical, both to make the boat appear small and to reflect this sense that the heavens were watching over them in their undertaking. After four impressions with an uncarved block I cut out some small circles and kept printing with washes of ultramarine blue. After every other impression I cut out the stars just a little wider to make them appear to glow. After a few more ultramarine impressions I found that I wanted a deeper blue, so I added a layer of pthalo blue, which is a very intense pigment. I liked what happened, but afterward I decided that I'd rather not use modern pigments like pthalo blue. I'd rather stick to pigments that were available in the 17th and 18th centuries. So I added some red oxide and another layer of yellow oxide and more ultramarine blue. What you see in the photo above is a total of 12 impressions. I think one or two more impressions will get me where I want to go. Hey, how come you guys never told me about Nishinouchi paper?? It's great stuff. It has a translucency like parchment but plenty strong. A little hard to work with when it gets too wet, but I've been letting it dry between impressions and once it dries it's just the way it was before I printed on it. It has a lot of character, some long different-colored fibers that add charm, and these qualities plus the rich natural color make it a perfect paper for my 400-year-old topic. Then I cut out a proof of my Mayflower block so I could move it around on the print and see where I might want to put it. I think Lynita Shimizu first taught me that trick. A piece of tracing paper placed on top allows me to then draw on top of the print and the cutout to experiment with ideas for the next step. When in doubt, do it again. I re-carved the Mayflower so that it faces left (west). It would have bothered me the other way, no matter how I rationalized it. In the traditional Japanese method of printmaking that I use, a block is carved for each color. Lately I've been feeling frustrated by the fact that I'm carving very large, very labor-intensive blocks and then using them just once. This plus the amount of pre-planning involved often makes me feel that the process outlasts my internal creative current. By the time I finish a print, I've often mentally and emotionally moved on to another stream. 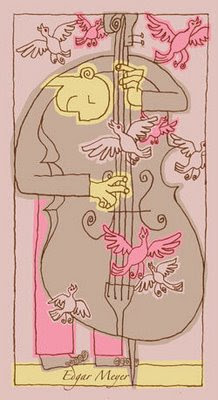 What I want to do is to find a way to make prints that are still moku hanga but are more spontaneous to create. My thought for this series is to carve up little blocks that I can use and combine in a number of ways to build larger prints. Neither of these Mayflower blocks has a kento and both are on small pieces of wood, just large enough to fit the images. The next step I'll be taking is to set up a large block with kento marks that will fit my paper (I'm testing a paper called Nishinouchi from McClain's). Then I'll just start printing a background for my Mayflowers to sail on using some of the techniques I've already experimented with -- stencils, printing with my hands, wiping -- and see what evolves. Sort of like moku hanga monoprinting, I suppose. We'll see what happens. This past weekend I taught moku hanga for the first time at Zea Mays Printmaking in nearby Florence, MA. There were 9 participants and we had a lot to do in just two short days, so it was a jam-packed weekend. I asked the students to come with several copies of an image prepared to size so that we could get right down to business. Most of the participants came with a lot of art experience, and many had done other forms of printmaking. There was a lot to learn all around. Leslie Moore, an artist who does animal and pet portraits in ink and black and white woodcut, came down from Maine. It was great to see the group start to bond and I was particularly touched when I noticed Fran Kidder, a local painter, helping Dayna Talbot, a painter from eastern MA, with her kento. I spent most of the weekend just wandering from table to table, troubleshooting problems when needed and just enjoying watching these 9 women discover the intricacies of moku hanga. Puzzling with Kristen over her first block. Dayna carving an intricate keyblock. Adrienne discovers finger printing! Sarah, seated behind Adrienne, carved just two simple blocks but experimented with them so that no two prints were quite the same. Adrienne used a simple keyblock image with color fills. A carved keyblock by Kim. Thanks to you nine wonderful women who came to the workshop and thank you to Zea Mays studio for hosting us so well. Here's a proof of the Mayflower block. It's a little mottled because I didn't feel like mixing up a whole batch of rice paste just for a few proofs. I used a green tint that was already mixed up from another print and took the opportunity to test a new paper called Kozoshi that I bought from Graphic Chemical and Ink. It's a thin paper and I'm not sure how well it would hold up over multiple impressions, but it's sized, it's a pretty color and it's kind of parchment-like. I'm going to bring it to the moku hanga workshop I'm teaching at Zea Mays Printmaking this weekend so the students can give it a whirl. I'm also bringing Shin Torinoko from McClain's Printmaking Supplies, which hanga artist Mary Brodbeck recommended as a good reliable student paper. 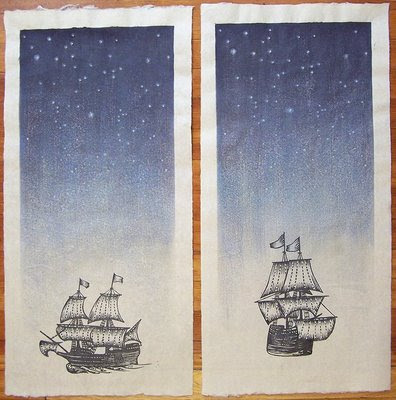 Here's the Mayflower printed on Shin Torinoko. It's a fairly heavy, bright white paper that takes the ink beautifully, even without rice paste. About 4 years ago, when I was so sick of sitting in front of a computer I considered just giving it up, I discovered an online web site that gave me an opportunity to begin to "reinvent" myself as an illustrator and an artist, a site called Illustration Friday which offered a weekly illustration challenge. Back in the early days of that site, there were less than 100 submissions each week (now there are 700 or more) and the community that formed was very strong, friendly and intimate. One I-Friday participant whose brilliant work I noticed right away was Cindy Woods of Richmond VA, and we struck up an online relationship that has lasted to this day. Among other things I owe to Cindy, it was her insistence on the value of blogging that pushed me to start Woodblock Dreams. We've met in person on several occasions and she's as wonderful as her art. Cindy is in hospice care now, in the final stages of a battle with cancer. A few weeks ago I received a package from her and inside I found two beautiful books, an art book of the works of Munakata Shiko and the book pictured here, Chapbooks of the Eighteenth Century. The reproduced woodcut illustrations in these chapbooks are crude but totally delightful, and I'm using them as a reference and inspiration for this new series of pilgrim prints. Once again, Cindy's kindness and generosity have sent me off on a new journey. I wish Cindy all love surrounding her as she embarks on her own new journey. You can see a whole lot of Cindy's work on her Flickr site. Added 11/23/08 - Cindy passed away on 21 November, peacefully and surrounded by family and friends. She will be missed by many many people, those who lived close to her and those who knew her only from her online presence. Godspeed, Cindy. During this long presidential campaign, as one difficult and contentious issue after another arose, I found myself wondering what my ancestors would have thought about all of this. I come from a New England family that traces its ancestry back to the Plymouth Colony. My branch of the family ended up in rural Vermont in two small towns, Rockingham and Saxtons's River, that lie about an hour north from where I now live. Most of my Vermont forbears survived as farmers, merchants and clergymen. It's a genealogical treasure trove to visit these towns, as I can study 200 years of my lineage just by visiting a couple of cemeteries. The older I get the more I realize how deeply I carry these people within me, so now that the election is over and I can breathe again, I'm exploring the idea of doing a series of prints about my pilgrim people. I plan to use images carved in the style of 17th century engravings and woodcuts and I decided to start at the beginning with the Mayflower. Tomorrow I'll proof this block. A couple of weeks ago I went to the IFPDA Print Fair for the second year in a row on a bus trip sponsored by the Smith College Museum of Art. It was a little less fun this time simply because I had been there before and I knew what to expect, but I learned some new things nevertheless. I knew a few folks on the bus trip this year too (last year I traveled alone), so it was nice to have traveling companions. With Essence Mulberry, duly inspired by the faded colors of hand-painted fifteenth-century prints seen at the Metropolitan Museum of Art, and a lushly ripe mulberry tree on Tyler's property, Frankenthaler set out to re-create the look of painting with mulberry juice. She carved four blocks, one each of oak, birch, walnut and lauan, all having different printed effects. Works by the British modernists were popping up everywhere, probably because of a recent exhibit of British prints organized by the Boston Museum of Fine Arts in collaboration with the NY Metropolitan Museum of Art. I love the web site of Davidson Galleries of Seattle and had looked for them at last year's print show, but they didn't attend. I was happy to see them there this year. It was especially fun to see them because I had met them in October when I visited my show at Cullom Gallery. William P. Carl Fine Art Prints of Northampton MA showed the lovely white-line print by Ada Gilmore Chaffee posted above. And I saw a couple of Gustav Baumann prints at The Annex Galleries booth for tens of thousands of dollars that made me want to sell my condominium so I could buy them. 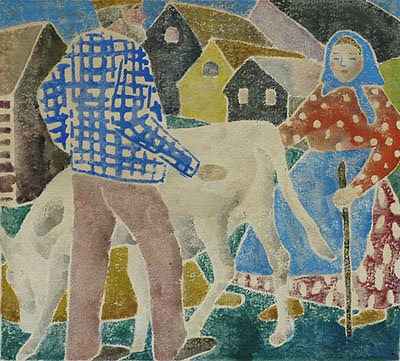 I first became acquainted with Baumann's work when I lived in Taos, New Mexico in the early 1990s (Baumann lived in Santa Fe, NM in the early 20th century). 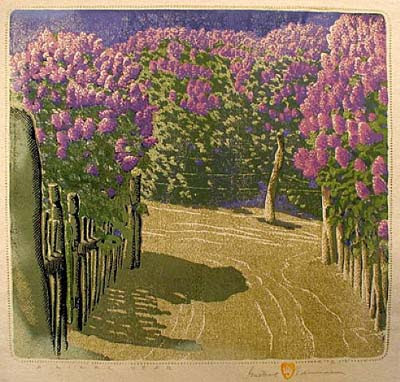 His print A Lilac Year was always especially meaningful to me because during my first spring in Taos I was shocked and delighted as a New Englander to discover that the town was full of lilac bushes. Seeing A Lilac Year in person was a huge thrill. Based on a satellite view of the Great Wall of China at Jyonguan. With the addition of a few disappearing nomads, I feel satisfied with this print as it is. Although the population of China overall is over 90% Han Chinese, the western provinces are populated with ethnic minorities, most notably Tibetans and Muslim Uighurs, groups whose language, culture and religion are distinct from those of China's Han majority. 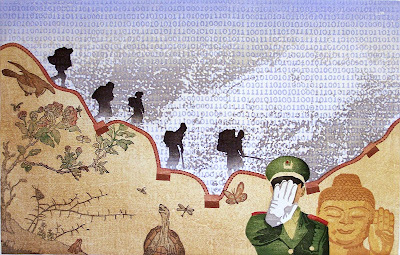 Both the Tibetans and the Uighurs complain of a colonial-style Chinese presence in their territory which imposes tight religious and cultural strictures. They also insist that economic development in their regions has disproportionately benefited Chinese migrants. Han Chinese, on the other hand, say that they are bringing progress and economic opportunity to backward areas and don't understand why anyone would complain. As I've said before, it reminds me of the westward expansion of the United States in the 1800s and the way that "progress" decimated the native American peoples and their cultures. Mudra is a Sanskrit word describing a symbolic or ritual gesture, usually of the hands and fingers. Mudras are often seen in the iconography and spiritual practice of Hinduism or Buddhism. Abhaya in Sanskrit means fearlessness, and the abhaya mudra symbolizes protection, peace, and the dispelling of fear. The gesture is made with the hand raised to shoulder height, arm bent, and palm facing outward, and can also be deciphered to mean that the hand is empty of weapons thus indicating friendship and peace. According to Buddhist tradition, the historical Buddha made this gesture immediately after gaining enlightenment. To western eyes, the abhaya mudra looks like the gesture meaning "stop" and the juxtaposition of these two meanings of the gesture captures for me the essential conundrum of trying to understand China -- the double message of "look at us" (the Olympics, the tremendous economic and technological growth, China's venerable ancient cultural contributions) and "get out of our business" (human rights, product safety, Tibet). Gradually building up the green uniform. When I first started doing moku hanga I used to try to get heavy solid color all at once. Everyone told me that it was better to build up the color slowly, and I think it's true. Here I cut away some "shirt" and added more green. More cutting and a darker green. It feels so good to be making progress on this print! Of course, having enough time to do all this printmaking means I don't have so much illustration work on my desk. Unfortunately, my fortunes as an illustrator tend to rise and fall with the Dow Jones Industrial Average. But tonight I happily added a couple of layers to define the Wall.